Mark Ruffalo Teases "New Stuff" for "Thor: Ragnarok"
Thor: Ragnarok is a guaranteed smash—and not just because Mark Ruffalo's The Hulk will be in it to, well, smash things up. On May 20, Marvel announced that Cate Blanchett has joined the cast as a mysterious and powerful villain named Hela. Other additions to the hit franchise include Jeff Goldblum as Grandmaster, Tessa Thompson as Valkyrie and Karl Urban as Skurge. And it wouldn't be a Thor movie without Chris Hemsworth as the titular character, or without Tom Hiddleston as Loki, Idris Elba as Heimdall and Anthony Hopkins as Odin, Ruler of Asgard. When E! 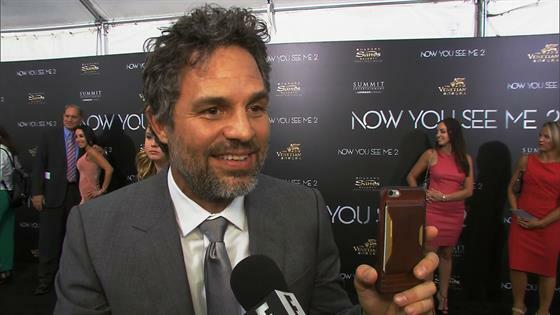 News caught up with Ruffalo in New York City Monday at the premiere of his new movie, Now You See Me 2, he promised that fans won't be disappointed with the latest chapter in the Marvel Cinematic Universe. "I haven't started filming, but I've been prepping for it and I'm really excited about it. I think we're going to do some really cool stuff," the 48-year-old actor teased. "We're going to see some new stuff with the Hulk. We're going to see some new stuff with [Bruce] Banner. We're definitely going to see some new stuff for poor old Thor." Ruffalo is eager to work with director Taika Waititi, who follows the paths blazed by Sir Kenneth Branagh (2011's Thor) and Alan Taylor (2013's Thor: The Dark World). "He's amazing," the actor said. "It's got a lot of heart and a lot of fun in it, so I'm excited to get started on that." The film may be darker in tone, but the mood on set won't be. "Who can behave around Cate Blanchett?" Ruffalo joked. Who indeed. Ruffalo's excitement mirrors that of producer Kevin Feige, who's welcomed the newcomers with open arms. "The continuation of the epic Thor franchise will be powerful and unique, and with the additions of Cate, Jeff, Tessa, Karl, and Mark to the cast we have the makings of his most dangerous and heroic adventure yet," he said in a statement. "The sheer, raw talent each of these actors brings to the screen can't be quantified. Having any one of them join the Marvel Cinematic Universe would be an honor, and having all of them is incredible." Thor: Ragnarok is scheduled for release on Nov. 3, 2017.